Reviewed by Thomas G. Brock, Ph.D.
Scientists who are studying autoimmunity or rheumatoid arthritis know something that many others might not: citrullination of proteins is hugely important. This form of post-translational protein modification creates novel epitopes on common proteins, providing ‘neoantigens' that are now known to be important in autoimmune disease. Citrullination can occur outside of the cell, in the cytoplasm, and in the nucleus. Because of this, it can affect such diverse processes as blood clotting, skin differentiation, and chromatin remodeling. Although the roles for this process are only beginning to be understood, citrullination has established actions in inflammatory signaling. By the end of this article, readers should not only learn some hot science to impress friends but may even have new ideas for their research ventures. The biochemist should know about citrulline from the urea cycle, an important process for removing ammonia in animals. Citrulline is an α-amino acid that is structurally similar to arginine. In the urea cycle, carbamoyl phosphate is produced from ammonia, bicarbonate, and phosphate. Citrulline, synthesized from carbamoyl phosphate and ornithine by ornithine transcarbamylase, is simply an intermediate in the generation of arginine, which is then cleaved by arginase 1 to give urea and ornithine. In this cycle, citrulline is synthesized within the mitochondria and then exported to the cytoplasm for metabolism. The serious gardener might recognize Citrullus lanatus (occasionally given, mistakenly, as C. vulgaris) as the formal name for watermelon. These cucurbits apparently originated in southern Africa and were cultivated in the Nile Valley some 4,000 years ago. Now grown worldwide in temperate climates, watermelon is remarkably rich in citrulline and arginine as free amino acids.1 In fact, the amino acid citrulline received its name when it was first isolated from the juice of watermelon over 80 years ago. 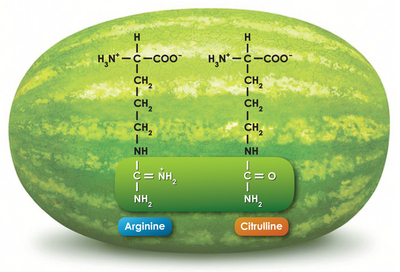 As citrulline is a precursor of arginine and arginine can give rise to the vasoactive mediator nitric oxide, watermelon is not only tasty but also a potentially healthful treat. PAD4 is the principle citrullination enzyme in RA. It is expressed in neutrophils, eosinophils and tissue resident macrophages, but not lymphocytes or circulating monocytes. PAD4 normally has roles in cellular differentiation and the regulation of transcription of p53 and estrogen receptors. However, joint inflammation is characterized by infiltration of PAD4-bearing leukocytes. In one scenario, cellular activation, with a rise in intracellular calcium, leads to PAD4 citrullination of leukocyte vimentin, an intermediate filament involved in leukocyte attachment, migration, and cell signaling. Alternatively, widespread leukocyte necrosis resulting from release of cytotoxic compounds during degranulation results in the release of PAD4, as well as numerous cytoskeletal proteins, into the calcium-rich inflammatory milieu, resulting in indiscriminate citrullination of multiple targets. In either case, the stage is set for the development of autoantibodies. One question remains: why doesn't this happen in more inflammatory settings? As mentioned above, each of the five PAD enzymes appears to have distinct substrates and roles (see Table 1). For example, while PAD1 and PAD3 are both associated with epithelium and can contribute to keratinocyte differentiation, PAD1 is primarily involved in maintaining cutaneous barrier function and PAD3 has a central role in follicle development. Of all the PADs, PAD4 appears to be unique in its ability to enter the nucleus. As a result, PAD4 can citrullinate nuclear substrates, including the histones H2A, H3, and H4, as well as the histone acetyltransferase p300. While the actions and implications of PAD4 in the nucleus are still poorly understood, interesting aspects have been revealed. First, deimination interplays with methylation of arginine residues: PAD4 can remove monomethyl groups from arginine residues through a demethyliminase activity, reversing the actions of protein arginine methyltransferases (PRMT) (Figure 3).8 PAD4 cannot, however, act on dimethylated residues. Similarly, deimination by PAD4 prevents arginine methylation.9 Thus, PAD4 can block or reverse some of the actions of PRMT. Figure 3. PADs demethylate mono-methylated arginine residues (A) PADs produce citrullinated side chains on either normal arginine or arginine that has been mono-methylated by PRMTs. Aminotransferases (AT) may convert citrullinated chains to iminated chains. (B) PRMTs work with HATs to decondense chromatin. PADs and HDACs initiate the return of chromatin to a condensed form by citrullinating mono-methylated arginine and deacetylating lysine residues on histone tails. The tumor suppressor protein p53 regulates the expression of various target genes, whose products in turn modulate cell growth and apoptosis. PAD4 and HDAC2 interact with p53 via distinct domains, resulting in their co-localization at p53-regulated promoters and suppression of transcription.13,14 The PAD4 inhibitor Cl-amidine and the HDAC inhibitor SAHA additively induce gene expression. PAD4's role as a transcription co-repressor for p53 may help explain the role of PAD4 in cancer: the deiminase is overexpressed in cancers of the breast, lung, liver, esophagus, colon, kidney, ovaries, endometrium, uterine, and bladder.15 The PAD4 inhibitors F- and Cl-amidine display cytotoxic effects towards cancerous cell lines but not against non-cancerous lines.16 This suggests that PAD4 inhibitors would be useful for treating certain cancers, as well as RA. On a different front, citrullination by PAD4 plays a role in the immune response to bacteria. In addition to their vast granulocytic armamentarium, neutrophils unleash highly decondensed chromatin structures, called neutrophil extracellular traps (NETs) to trap and kill pathogenic bacteria.17 Impaired NET formation predisposes individuals to bacterial infection. Uncontrolled hypercitrullination of histones by PAD4 mediates chromatin decondensation.18 PAD4 deficient neutrophils cannot make NETs and PAD4 -/- mice are more susceptible to bacterial infection than PAD4 +/+ mice.19 Taken together, these results suggest that the systemic use of PAD4 inhibitors would compromise immune defense against infection.